Not to be confused with Set Up (2005 film). Setup is a direct-to-video action thriller heist film directed by Mike Gunther and written by Gunther and Mike Behrman. 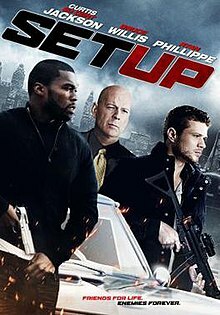 It stars 50 Cent, Bruce Willis and Ryan Phillippe. It was released straight to DVD and Blu-ray on 20 September 2011 in the United States. In Detroit three friends, Sonny (50 Cent), Dave (Brett Granstaff) and Vincent (Ryan Phillippe), plan out a detailed heist. Their plans turn deadly when Vincent betrays the others, shooting Sonny and Dave (who dies on the spot). Sonny manages to survive and seeks revenge by teaming up with the most dangerous mob boss in town (Bruce Willis) to retrieve the money from the heist. Filming began in November 2010 in Grand Rapids, Michigan. Set Up is the first film in a $200 million deal with the production companies Cheetah Vision and George Furla's Hedge Fund Film Partners. Grindstone Entertainment Group and Lionsgate will distribute the film in the United States and Canada. ^ a b c d e f Borys, Kit (January 6, 2011). "UFC Fighter Randy Couture Shooting 'Set Up'". The Hollywood Reporter. Prometheus Global Media. Retrieved June 5, 2011. ^ McClintock, Pamela (December 10, 2010). "Phillippe, Dewan Tatum get 'Set Up'". Variety. Reed Business Information. Retrieved June 5, 2011.